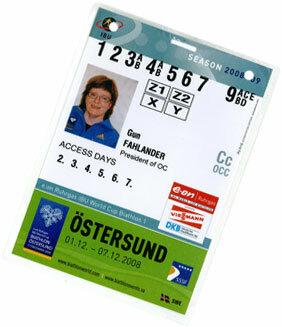 Fill in this form to register your interest in accreditation for the World Cup in Östersund. Please note that your application does not provide automatic confirmation of your accreditation for the event. If you are having problems with the formular below. Click on the picture at the right to open the formular in a new window. Then please try again. The new accreditation tool now includes all the E.ON IBU World Cup & WCH Events. Not only ON-LINE registration for Östersund. This tool is also available from the IBU Website www.biathlonworld.com and via this tool the media representative can create his/her account first and then apply for various events of the above mentioned level. You shall therefore create an account (also valid then later for registration for other individual events or via the IBU general application access) and then apply for the individual event. For the approval of an accreditation, both sides, the IBU as well as the OC receives an eMail information about the application in real time at the time the application is send. Then both parties have to approve and if the second approval is done, the Media Representative receives automatically an eMail notification, that the accreditation is approved.